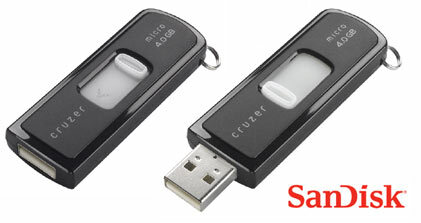 USB flash drives have increased in capacity in leaps and bounds since I last purchased one. In the few years since I bought a Crucial 128MB Gizmo!, the price of flash memory has been literally free-falling, due partly to economies of scale and the mass adoption of flash-based mp3 players. The size and sheer variety of these devices is astounding, but what I wasn't expecting when I inserted the drive was for a Launchpad application to start running, pre-loaded with special software! 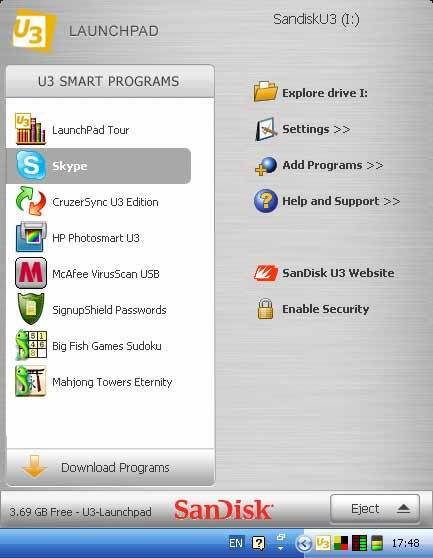 I had in fact purchased a 4GB SanDisk U3 Smart Drive. U3 is a technology developed by SanDisk which effectively creates a platform for developers to build applications that install directly onto the flash drive rather than the host computer. This means that not only can you take your data with you, but you can take your applications too! When you insert your U3 Smart Drive into a USB slot on any computer, the U3 Launchpad is loaded, which is effectively like the Window's start menu, but instead contains menus to configure the drive, run installed applications and access your data. Nothing is installed on the host PC, so you can take your applications and data with you and its all secure and synced with your data on your PC back home. The software that's available includes Skype, Firefox, Opera, various password safes, Thunderbird, OpenOffice... The list goes on. Some applications are free, while others cost a small amount of money, but most have downloadable trials. Here's a full list of U3 software. Watch the video below for a quick guide to the U3 Smart Drive technology.